An exhibit and guest speakers at Eastern Mennonite University this fall will highlight the stories of conscientious objectors (COs) in World War I. Read an exhibit review by EMU archivist Simone Horst. 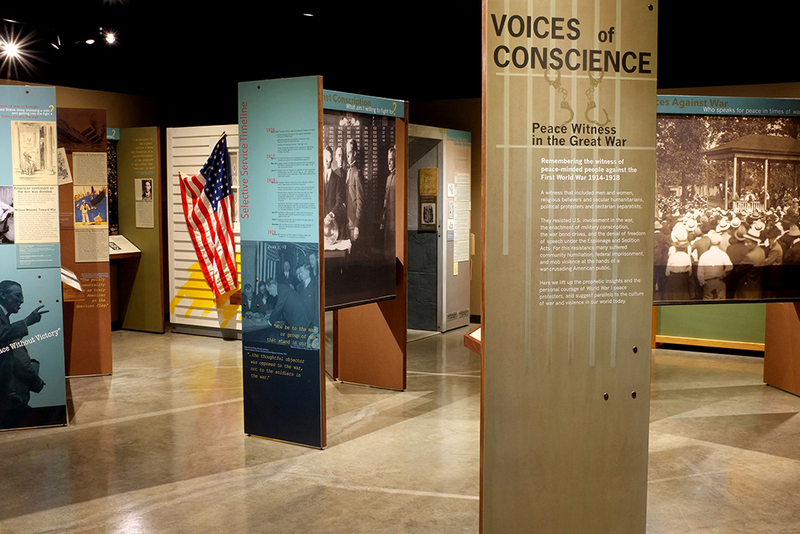 “Voices of Conscience: Peace Witness in the Great War” will be open at the Sadie Hartzler Library during regular library hours Oct. 1 – Nov. 17. The exhibit “lifts up the prophetic insights and the personal courage of World War I peace protesters, and suggests parallels to the culture of war and violence in our world today,” according to the Kauffman Museum in North Newton, Kansas. . Motivated by a variety of reasons both religious and secular, resisters of U.S. involvement faced humiliation, imprisonment and violence. 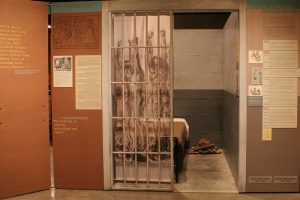 The Voices of Conscience exhibit includes a recreation of an Alcatraz prison cell where conscientious objectors were punished. Developed by the Kauffman Museum in North Newton, Kansas, the exhibit is on a seven-states tour. Its 10 themes are presented with text and quotes, large-scale graphics and photomurals surrounding a recreation of an Alcatraz prison cell where conscientious objectors were punished. A related display showcases materials from EMU’s Archives, including papers and photos from eight conscientious objectors relating to their conscription, time spent in military camps, work during the war, and their discharge. Included Virginia Mennonite Conference Archives materials highlight the trial of Rhine Benner and L. J. Heatwole, charged under the Espionage Act of 1917 after telling congregants not to buy U.S. bonds and War Savings Stamps. Wednesday, Oct. 17, MainStage Theater, 4 p.m.: Duane Stoltzfus, professor of communication at Goshen College and author of Pacifists in Chains: The persecution of Hutterites during the Great War (Johns Hopkins, 2013), will present “On the Front Lines of Conscience: An Account of Four Hutterites Imprisoned at Alcatraz” during a university colloquium. “People often hear only the experiences of COs who were from the Historic Peace Churches, and they are usually filtered through the perspective of an historian,” Yoder said – whereas learning through primary documents can bring to light additional complexities in their varied experiences. I also know one personal story of the experience of Nevin Bender, my father-in-law during World War I. I realize we do not have the full story of the men who were drafted during that war. Thank you for bringing these stories to our generation and today’s young men and women who have additional challenges.